I’ll start this off by giving fair warning: the “New” in the “New Cereal Roundup” title is inaccurate. “Inaccurate” being a polite way of saying “a lie”. I’m well aware that at least one of these two cereals isn’t new. I wasn’t sure whether to start with that one, and get the controversy out of the way, or end with it, so at least this article starts with some newness. The date in the next sentence will probably give away which order I chose. General Mills’ web site claims that Chocolate Lucky Charms was introduced in 2005. They have no reason to not tell the truth, but I am still going to go ahead and wildly accuse them of lying. This accusation is based solely on the assumption that if Chocolate Lucky Charms existed for that long, I would have heard of it. My cereal modesty knows no bounds. Although it’s possible that “introduced” is one of those situations where they tested it out in three Piggly Wigglys to see how it went. Or it’s just possible that I’ve been wrong about this whole thing. Regardless of when it was introduced, I only saw it recently. At first, it seemed like an unnecessary chocolatizing of a cereal that didn’t need it, like Cocoa Frosted Flakes. 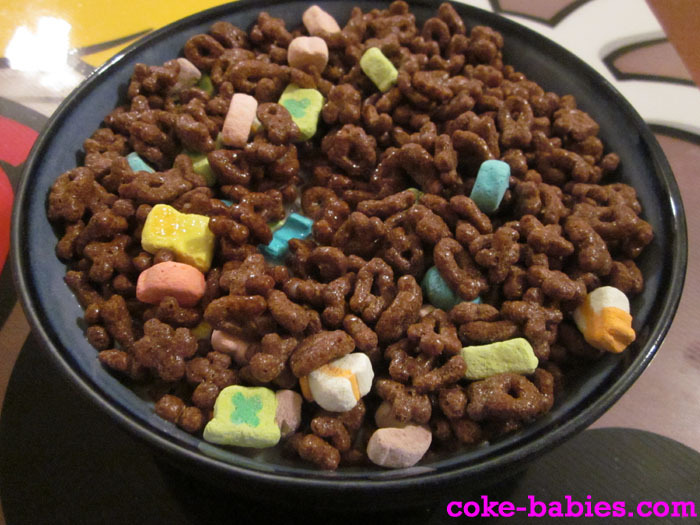 But then I did the math: chocolate pieced cereal + marshmallows = Count Chocula. I was in. 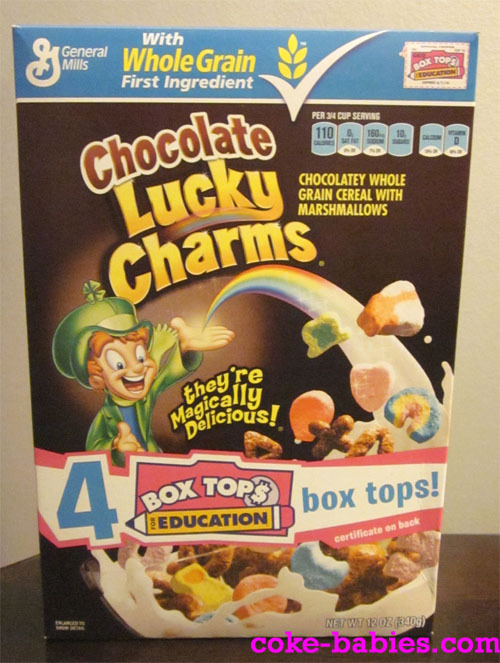 Based on the box, Chocolate Lucky Charms is clearly hoping the “Lucky Charms plus chocolate” aspect will be enough to entice kids’ attention. And, well, they’re right. That’s a fabulous sugar combination. And they should be grateful that is enough to gain attention, because the box rapidly goes downhill once you turn it around. 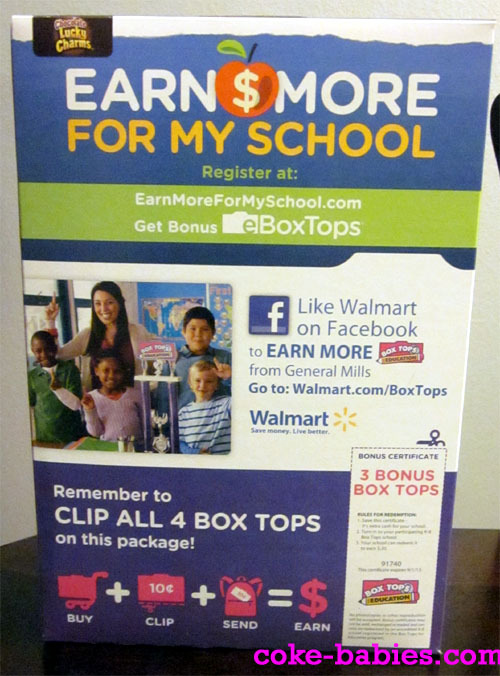 I am familiar enough with Box Tops For Education. And by “familiar enough” I mean, “My wife is a teacher so I give them to her, and have zero idea of what happens after that.” But it seems peculiar that on a box that’s geared clearly towards children (and myself), that they wouldn’t even put a token activity page on the back. First of all, it’s an alarmingly dull topic to read when you have nothing else to do while eating cereal. Secondly, it just seems like you would want to keep the word “education” as far away as possible from a box of sugary cereal. Opening the box (and bag, obviously, otherwise this review wouldn’t get very far), I am greeted with that familiar “chocolate in quotation marks, and that chocolate is so barely chocolate-y that you still have to say ‘in quotation marks’ even though the description is already in quotation marks” smell. Someone who knows more about foreign sounding ingredients like “Trisodium Phosphate” and “corn” might be able to explain this, but I’ve never understood why some chocolate cereals just can’t get the chocolate flavor correct. Cocoa Pebbles, Cocoa Krispies, and Chocolate Cheerios know what “chocolate” tastes like. Then you have cereals like Cocoa Puffs, Count Chocola, and, apparently, Chocolate Lucky Charms, whose chocolate flavor is just slightly off. Slightly off isn’t necessarily bad, it’s just not where it should be. 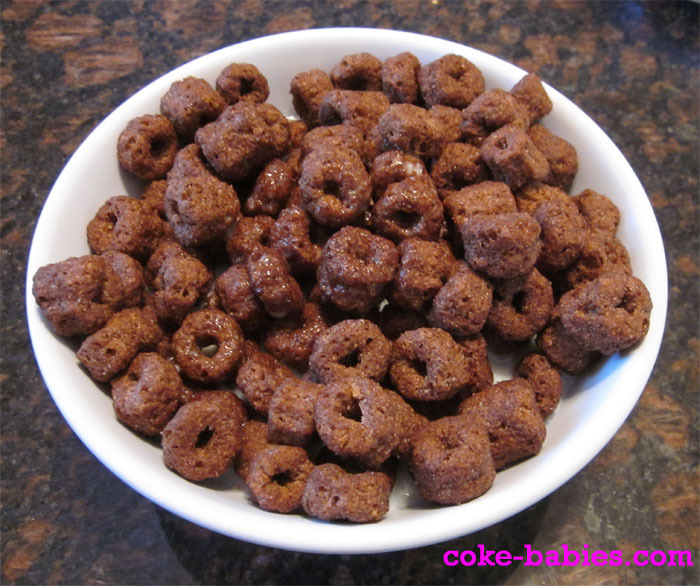 Some cereals can pull off the odd chocolate flavor, like Count Chocola, and some can’t, like Cocoa Puffs. I was a bit worried that the marshmallows would be chocolate as well, and make the cereal one note. I guess “worried” isn’t the best term, since I knew the marshmallows wouldn’t be chocolate about one tenth of a second after seeing the box and noticing the non-chocolate marshmallows. But “worried” adds a sense of drama to the proceedings, so we’ll stick with that. The cereal itself tastes almost exactly like Count Chocula – similar levels of sweetness, similar “””””chocolate””””” flavor, similar “sugar and chocolate had a cereal baby and here it is” eating experience. The only difference is the cereal pieces are slightly smaller, and not as puffy in both size and texture. That difference is fine with me, as the cereal is still really good, and that way come Monster Cereal season, I can have two nearly identical yet different cereals on my shelf, and not have it seem redundant. As for the milk, it does an admirable job. It comes nowhere close to the top echelon of cereals that leaves you with essentially Chocolate Quik in the bowl, but far exceeds the stingy chocolate milk cereals like Krave. I would highly recommend trying a box of Chocolate Lucky Charms. Unless you’ve been buying it since 2005, in which case I guess just continue doing what you’ve already been doing. Before diving into this Post effort, I should give some recent background on a Post cereal. 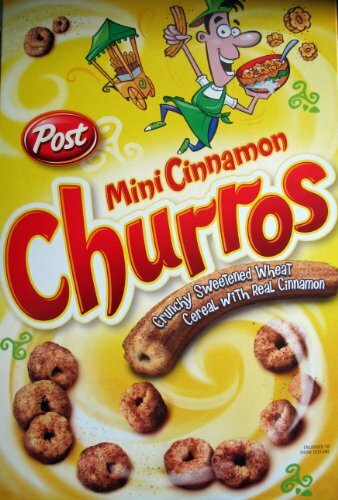 About a year or so ago, I saw a box of “Mini Cinnamon Churros” cereal. I was very excited for these, since it combined two of the greatest foods in existence. Unfortunately, the cereal turned out to be quite average. That was about where it ended for my interest in reviewing them. They are certainly okay, but nothing worth getting too worked up over. Plus, I’m not sure the shape is the best idea. I know it’s supposed to look like sliced up churro pieces, but instead they sort of look like… anuses. Even though I didn’t find the cereal to be a rousing success, I still give Post credit for trying a fun cereal idea. I’m sure a lot of people like the idea, and the cereal itself; it was just “meh” for me. 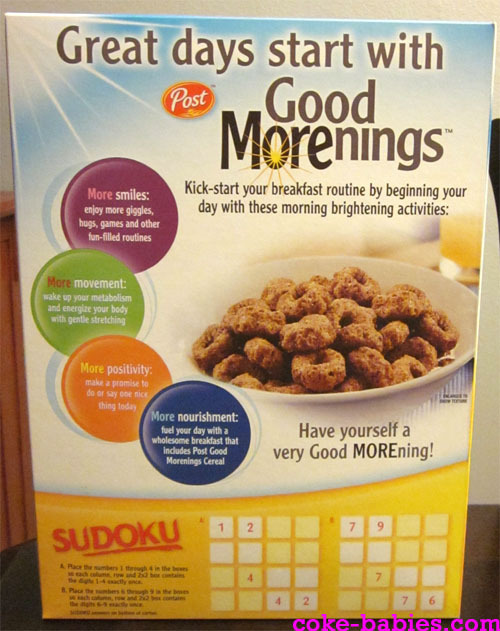 So that was my recent Post “new cereal” history coming into Post’s new effort: its Good Morenings line. The Good Morenings cereal line is off to a rough start, due to its atrocious name. While it’s not the same joke, making a pun similar to Alkaline Trio’s “Good Mourning” isn’t the most positive way to start your day, unless you are a mortician. The other issue with the line is – what is its purpose? The box’s message is this amalgamation of “value”, “healthy”, and “positive affirmations”. The main reason the value aspect appears sad is that the box design looks overwhelmingly like store brand packaging. Similar to Tropicana’s disastrous redesign a few years back, the Good Morenings box looks like it is cheaper than it actually is. The biggest issue with their value proposition is the claim of “21 Bowls of Cereal!” I’m fine when cereal companies refer to “servings”. Yes, fine one serving is 3/4 of a cup, despite the fact that no one ever eats that paltry amount. And I’m not even talking about my idea of a bowl of cereal, which tends to be a mixing bowl. Even normal people eat much larger servings than an actual “serving”. So trying to claim that these “servings” are equivalent to a bowl of cereal – heresy! The back of the box doesn’t bring much relief. You could play suduko, which is a strange step up from the typical maze. Or you could complete some of the suggested activities, such as: enjoying more giggling, gentle stretching, or promising to say one nice thing today! 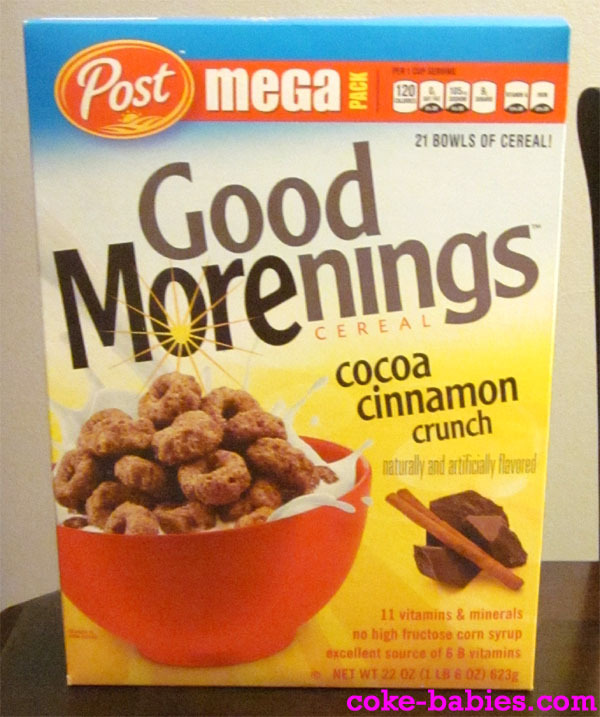 Despite the packaging’s depressing tone, I still decided to pick up a box of the “Cocoa Cinnamon Crunch” cereal, since that flavor was far and away the most interesting sounding of the line. For all of its touting of nutrition, the Good Morenings line seemed to have gone with the cereal compromise of “It’s not as bad for you as other cereals!” theory. Similar to the Reduced Sugar Frosted Flakes / Trix / etc, where the nutritional ground it lands in wouldn’t exactly place it in that weird area of the cereal aisle with Kashi and that Clifford cereal. It lowers the sugar, but the overall nutritional scope just winds up in this purgatory area. The cereal itself is very similar to Churros in size and shape, although the texture seems to be a little crunchier. The taste is… odd. It has chocolate flavor and it has cinnamon flavor, but something seems off about the whole flavor proceedings. This might explain why I never got into poetry as a profession, but I just can’t seem to put into words why it’s not very good. To be clear – it’s not bad, just not good. As for the milk – on the plus side, it leaves some cinnamon-y residue like the Churros cereal and Cinnamon Toast Crunch, but none of the chocolate seeps into the milk. I’m reconsidering Post’s “21 bowls” claim, because the cereal pieces are monstrous. Post sure seems to love gigantic cereal pieces – this, Churros, Honeycomb, even Waffle Crisp. I guess they had to overcompensate once they realized an entire box of Grape Nuts only filled one bowl. But having gigantic cereal pieces in an attempt to fill a bowl more easily is cheating, so I rescind any of my reconsideration. I can safely say I wouldn’t get Cocoa Cinnamon Crunch again. I would, however, probably try some of the others since they sound good as well. No, I don’t have a very good sense of pattern recognition, why do you ask? The Waffle Crisp seems worth a try since my issue with the original Waffle Crisp is that its overwhelming sweetness moved it into “gross” territory. So a reduced sweetness on that could help it greatly. The Frosted Flakes and Strawberry and Créme could be good, as well. And despite its claim as a value cereal, you can tell Strawberry and Créme is fancy because they spell cream differently and it has that thing over the “e” that I had to hit ALT+0233 just to type. Berry Loops and Vanilla O’s sound like a pass, because… well, because they do. I’m done explaining myself!